WHY LET THE KIDS HAVE ALL THE FUN?? In Young Life there are no spectators because it is harder to explain the Gospel then to experience it. The same is true with the Incarnation, understanding salvation, God’s love, and even your local YL Club and Camp. You have to ‘come and see.’ None of the principles and elements of the mission are reserved just for adolescents. The best week of your life isn’t just for teens. Young Life camp can make a profound impact on the adults in your ministry too. Not to mention, camping for your adults can make a huge impact on your local ministry in the long run! Q. Do you have a need for more adults to join in your area ministry? Q. Do you want to reconnect with alumni, friends and former staff in a manner that is natural, fun, and benefits both them and your area? Are you looking for a world-class window into the mission of Young Life? Look no further! What better place to get adults excited about the Young Life ministry than at camp? Let adults have the best week of their life too and catch a glimpse of how they can help support your local ministry. Inviting adults to Adult Camping trips increases awareness, ownership, and investment in the ministry. Make a yearly plan of all camping opportunities NOW and mark them on your calendars. Work backward to see when you need to start prepping the adults in your community. Add a role to your committee for someone to take charge of the Mission Community. Assign your Mission Community Director the job of engaging adults on these Adult Camping opportunities. Reach out to those who are in charge of the men’s, women’s, couple’s, and family camps and see if there are ways to help support the event itself. Often, there are opportunities to help with registration, skits, worship, and more. Knowing these needs may help you find ways to engage the adults in your community and help them have deeper buy-in for the trip. Spending a little time investing in an Adult Camping Plan for your area will reap amazing dividends for your adult friends and your area ministry. We all know that a Young Life camp experience with kids serves to solidify relationships as distractions are minimized and shared-experiences abound. Similarly, getting away with adults from your area can truly accelerate the process of building trust, knowledge, and a desire to serve. Whether being an adult guest at summer camp, experiencing Trail West, or attending a weekend retreat or family camp during the school year, a Young Life camp experience creates space to listen and learn, opportunity to grow in relationship to God and others, and a clear path to meaningful opportunities to serve! WHAT TIME OF DAY DO YOU PRAY??? The video above is in my “hard-day” list of bookmarks in my browser. Regardless of the challenges in front of me, I know I can take three minutes to watch it and leave encouraged. It tells the almost-mythical-but-true tale of how Young Life started. It wasn’t Jim Rayburn — it was Clara Frasher, a kind older woman, who sat on a front porch across from Gainesville High School with her friends praying for the students for years. It would be awhile before Jim showed up to birth Young Life, but those prayers were the beginning. I’ve been blessed to have a prayer warrior on my committee or support team since I came on Young Life staff 18 years ago. I want to be one, but I’m still a work in progress. Lately, I’ve been swept up in the trend of "prayer moments.” My team prays every day at 12:11 to remind us of Revelation 12:11 and the triumphant blood of the Lamb. I’ve heard of others who pray at 9:38 (Matthew 9:38 — Lord give us the harvest workers!). The options are endless. For others it isn’t tied to a particular Scripture, but to an action. Maybe you pray at the same intersection every time you approach the school. Or decide as an area team to pray whenever you brush your teeth or turn on your car. One committee I know had a conference call … every day … at 5 a.m. …to pray for a season (s/o to D.C. YoungLives!). Here’s the point: As a community of believers, and particularly as committee, we make all types of commitments. To raise money. To visit club. To bake cookies. My challenge to you today is to make an area-wide prayer commitment. It might manifest itself in a couple of annual events (pray at the schools, prayer vigil at the Young Life house), but I’d say make it routine. Martin Luther said our prayers should be “short, often and strong.” Choose a verse, a time, a landmark or something else that unifies your team, and start praying. Start sharing at monthly meetings and at leadership gatherings how you see the Lord moving because of your faithful obedience. I firmly believe you’ll be glad you did. Clara Frasher’s 1933 prayer echoes around the mission and Kingdom today. May we be thoughtful, strategic and prayerful in adding our own voices to that glorious chorus, one hope-filled word at a time. Donors, friends of Young Life. What if I told you that these people are “closer than they appear,” and there is a committee role that can help you find them while also helping your committee operate like a great Young Life team? The MISSION COMMUNITY COORDINATOR is a role on your committee team that you may never have heard of, but can be a game-changer. As Young Life staff and leaders with kids, we know the value of getting away, playing together and having shared experiences. The same principles apply to adults. and releasing a committee person to focus on this will pay exponential dividends in your committee and your ministry impact. Keep community-building opportunities in front of the committee at meetings and via email. (For some ideas, see the attached pdf: “10 Opportunities for Your Committee to Operate like a Young Life Team. Partner with Young Life Alumni and Friends to find, greet and engage your local alumni, friends and former staff. This could include regular YL Connect searches for new alumni and friends near you, facilitating gatherings and preparing for future anniversaries or reunions. Like a good passenger side mirror, your mission community coordinator will help to create a connection between those who have been impacted by Young Life in the past and your ministry goals in the present and the future. As a committee chair and area director, take some time soon to meet, pray and task one of your committee people with this valuable role. “HOW WAS YOUR BANQUET?” These three questions will tell you the answer. 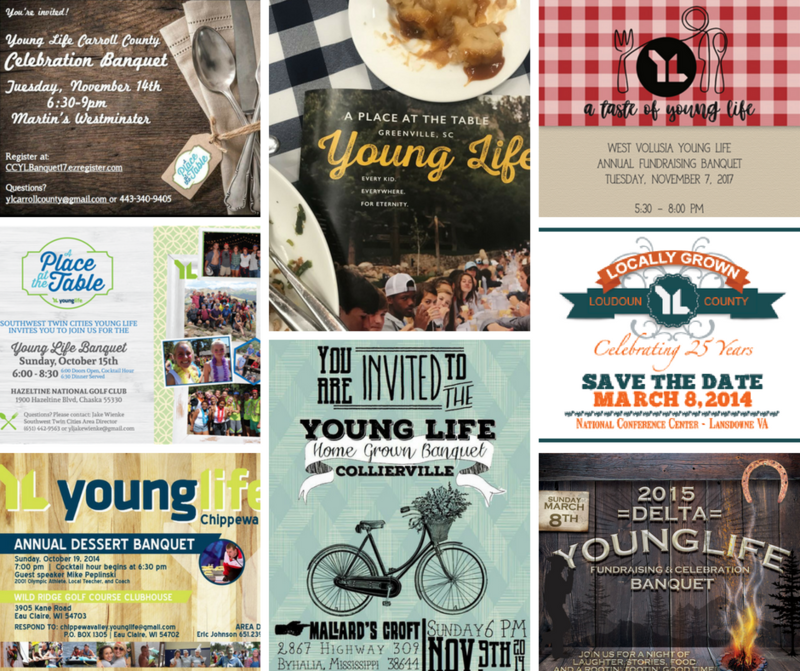 The area banquet is the one time during the year that Young Life is presented or showcased to the community. How do you know if your banquet did the job it was supposed to? I’ve seen easily over 150 banquets in my more than 40 years with Young Life. It is a good idea to know the evaluation questions BEFORE your banquet. That way you can shape the banquet to be “successful.” Here are my three questions to evaluate your YL banquet. WAS JESUS CHRIST LIFTED UP, SPOKEN ABOUT, AND HONORED? As Jim Rayburn, Young Life’s founder said, “Young Life isn’t just about Jesus; that’s the only thing Young Life is about.” When Young Life was explained during your banquet, was making Jesus known in a way kids can understand front and center? When our methodology of going into kids’ worlds to build relationships with them was represented, did we give God the credit for that idea because that’s what He did in Jesus? Did the kid’s testimony highlight a new life with Jesus? Did the speaker (if you had one) open the Bible and speak of Jesus? 2. WAS THE COMMITTEE PROUD? Folks who serve on the committee have devoted a lot of their time to supporting the ministry of Young Life, and in “putting on” this banquet. They want their friends, acquaintances and community to be introduced in a winsome way to Young Life. In a way, their reputation is at stake. If they are proud of the evening, it means you met the goal of presenting Young Life in an accurate and attractive way … not just the facts of what Young Life is and what are we doing, but also THE FLAVOR of Young Life, too. 3. WERE PEOPLE ASKED TO GIVE? Whether folks open their hearts and their wallets and give to support the local Young Life area IS UP TO GOD. But, for goodness sakes, “the invitation” to give, or what we might call “the ask,” must not be fumbled or vague. The financial pitch person doesn’t need to build the case or the need for Young Life; hopefully, the whole banquet did that. He or she doesn’t need to be funny or tell their whole story of their involvement in Young Life. It’s best if it’s short and sweet. Just present the funding need for the fiscal year in simple terms and ask — invite people to give and get involved. Have them fill out the involvement card, put it in the envelope and give it to the table host. Please don’t give the option to take it home and think about it. They were told that we coming to a fundraising banquet. Just ask. The rest is in God’s hands. The Two Goals of EVERY Young Life Banquet! But, for today, I just want to share the two partnering reasons for banquets to think about as you plan: funding and impact. Let’s be honest, most area directors know that the annual banquet is all about raising necessary funds to keep adding fuel into the tank so we can reach more kids for Christ. It’s a huge component of the night, and having spoken at more than 150 banquets, here are a few thoughts I have regarding this key focus of a banquet. Why does Young Life exist? We exist to introduce adolescents to Jesus and help them grow in their faith. So, this needs to be the focus of the night. Focus on the impact we are making. This can happen in materials on tables, videos shown, people who get up front, the area director’s “area report” session, and certainly the testimonies given. The kids who share their testimonies need to be evidence of our mission statement. These need to be sharp, worked with, and focused on communicating how Young Life made an IMPACT. I went to a banquet in the fall where the testimonies were a miss. The testimony might have been a great testimony for the church, or this person’s love of their friends, but it did not show a kid that came into contact with Young Life and was IMPACTED. You can convey impact at multiple points in the night. One of the best moments of a banquet is the student, or leader, or parent who can communicate IMPACT. Another spot to share impact is in the area report session, where an AD can look back at where they have been, where they are, and where they are going. I think that if a banquet team puts on the lenses of funding and impact as they plan out a banquet, it can make a huge difference. As the banquet and event unfold, and decisions are made about timing, food, buffet, plated, who speaks, what we do for the skit, what is on the table, and the rubric of FUNDING and IMPACT are utilized, it can make a huge difference. Let me know if I can assist or you have more to add. Bless you all as you move into the fall and the “banquet season”! Know Someone Who Should Be Getting 5.4 Friday Emails? Sign Up Here.